This post was written for inclusion in the monthly Carnival of Natural Parenting hosted by Hobo Mama and Code Name: Mama. This month our participants have shared their plans to keep their families safe. Please read to the end to find a list of links to the other carnival participants. If you prepare for the just-in-case car scenarios, you can all rest easier. Even if you think you're out just running errands or taking a leisurely drive through scenic views, it's prudent to have a just-in-case kit stashed in your car for emergencies. Just a small selection of basic but very useful supplies will help tide you over if your car breaks down somewhere remote, if you get lost or stranded in bad weather, or even if you're fleeing from a natural disaster or other urgent scenario where you have to rely on just what's in your car as you evacuate. Your car safety kit isn't necessarily supposed to have everything you might want or need in any situation, but it will contain the most likely helpmeets. Except in the most dire circumstances, it should you see you through until you can reach safety and replenish your supplies. This list is in no particular order, as items popped into my head. That makes it fresh and engaging. Yes, let's go with that. Because emergencies don't always happen in daylight or well-lit areas! Include a pack of backup batteries, or invest in a hand-cranking or solar-powered model. If it's solar-powered, be sure to periodically charge it in the sun. I'd go for fleece or wool so it will be warm (even if wet) but durable. Fleece folds up pretty small, which is nice if you have a compact car. Have at least one full-size one on hand and potentially more if you have a lot of family members to cover in an impromptu car-camping situation. Blankets come in handy for more than just emergencies, though: They're great partners at picnics and outdoor concerts, they can shield small passengers from the sun (or is it just my vampire kids that demand that? ), and they can cover up conspicuous shopping bags or backpacks that might attract thieves peering in your windows. In case you need a boost. And here's another tip: Replace your car's battery regularly, about every three to four years. If you're in the U.S. and are not sure if your battery's heading to the auto-parts graveyard, you can take it to AutoZone for free testing (and to get a replacement). Ask me how I know this. We have certain children who like to do "pretend driving" with all the lights and the radio and windshield wipers on — and wouldn't you know it? — our car wouldn't start after the latest round. When we took our battery in, the reader said — I kid you not — "Bad Battery." Ha ha! It calls it like it sees it. After that experience (and two days of waiting around at home for helpers to visit us for a jump and a ride), we also purchased a Jump-N-Carry starter that promises to jump start cars without a second vehicle being needed. We haven't used it yet to vouch for, but I like the extra peace of mind that we're that much more self-sufficient … assuming we don't have a Bad Battery! A small supply of nonperishable food can come in handy for mini-emergencies, like skipping naptime and being late for lunch besides! Just be sure to replenish them, because they'd really be necessary if you're ever stranded for hours or even days somewhere. If you have breastfeeding in your arsenal, like poor Kati Kim was able to do for her daughters when the family's car got stuck in a snowstorm, that's a good and reliable source of food right there. If your baby or children take formula or any specialty food, be sure to have some stored in your car and switch it out before it expires. Other good snacks for natural families include granola (of course, you hippy, you! ), jerky, nuts, and seeds. Naturally, the point isn't to plan to feed your family for a week, just have some items to fill the void in a minor delay, or to help sustain you in a more drastic emergency. Keep a couple bottles of water in your car if you don't already. They don't have to be purchased — you can fill and refill containers at home. Don't fill to the top if the weather's near or below freezing. Obviously, in hot weather the water will not be especially palatable, but it can be a merciful supply to have if you or your car's radiator needs it. This might seem like an odd inclusion, but consider if you were fleeing a natural disaster — you'd want your pets to go with you. Put a baggie or cans with a couple days' worth of nonperishable pet food into your car. This is particularly important if your pets have a special diet, such as prescribed by a vet. We feed our cats raw food, but for a just-in-case kit, any type of food that's nonperishable will do in a pinch. You can assemble your own or buy a pre-made kit. We've never used anything but the standard adhesive bandages in ours, but with two little kids who believe bandages are magic, we go through those a lot. Be sure to replace anything you use up or that's getting past its prime. Standard supplies in a first-aid kit include adhesive bandages, gauze pads, gauze wrap, medical tape, rubber gloves (for safety if helping strangers, and also helpful if you're ever in a yucky car- or weather-induced situation), tweezers, ointment, some sort of wound cleanser like hydrogen peroxide, pain reliever, scissors, nail clippers (well, I like to have these handy, anyway), and a first-aid instruction booklet for a refresher. If you take a first aid class, and I highly recommend doing so, you might get a similar booklet for free. The Red Cross also offers a free smartphone app. Speaking of phones, this is sort of a no-brainer if you ever use your car and your phone in the same day, but make sure you have a charger that fits your phone(s) and your car. You might even want a backup battery or some sort of backup charger that doesn't require your car's power. You'll need to research to see what works for your particular devices. Some sort of Swiss Army knife, hunting knife, utility knife, or other sharp tool can come in handy for situations ranging from slicing cheese for an impromptu picnic to … well, I won't say sawing your arm off if it's trapped under a boulder. A few of the large plastic variety can be used for … you know … trash, but also tarps, seat protectors for wet or muddy occupants, and make-do rain ponchos. Because you never know when you might need to tape some of your car back on. In case you find the perfect couch by the side of the road — or need to tie some of your car back on! We have used these. Sadly. More than once. They're likely included with your car, but make sure they don't need replacing. Various bags can come in handy, particularly if they can hold wet items. Now that we're all using reusable grocery bags (we are, right? ), having extra bags around should be a piece of cake. Because sometimes the sun sneaks up on you, especially in Seattle! I have a sense that storing it in the extreme temperatures of a car might damage it over time, so make it your backup sunscreen and keep your better stuff in your bag or at home. If anyone in your family needs medicine or other medical supplies regularly or in emergencies, be sure to keep a small amount of backups in the car if possible. Again, the heat or cold might damage them, so preferably use your at-home supply on a regular basis and keep these backups in the car for emergencies only. Be sure to replace them before they expire by putting a reminder on your calendar or giving yourself a trigger, such as whenever you refill your prescription. Or washcloths, rags, shop cloths, baby wipes, prefolds — whatever you've got. 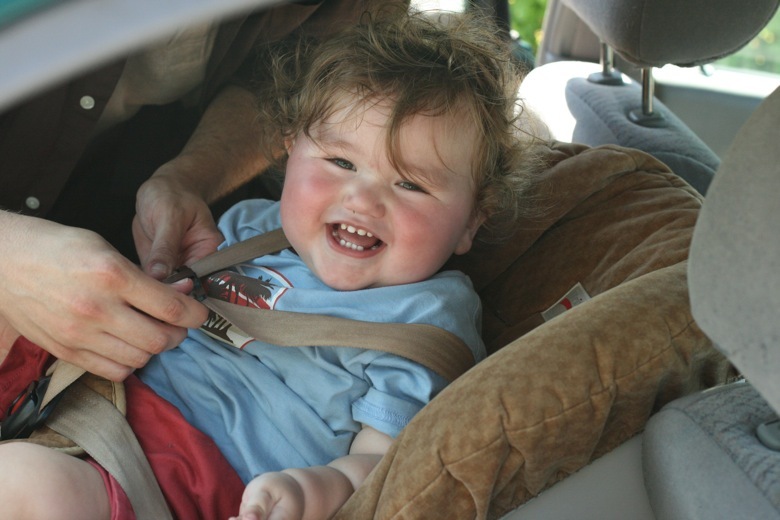 Keep a few in the car for kid spills, oil refills, or other unforeseen circumstances. If you're in the deepest part of winter and you might get hit by a blizzard at any moment, make sure you pack some extra socks, gloves, and hats along with an ice scraper and perhaps a small shovel and tire chains. We also used to keep a bag of kitty litter in the trunk if needed to add sandy traction to an icy patch and to weight the back of our car a little to help prevent skidding. If you're likely to travel through deserts, extra water and sunhats would be in order. In unpredictably rainy climes, stow jackets and a hat or umbrella. I like keeping hats, sunglasses, and a light sweater or jacket for every family member. Switch out your gear on a seasonal basis if space is tight. We once had to light a campfire from waaaaay across a campsite by lighting a cigar-roll of paper with our car's cigarette lighter and carefully carrying it back to the fire pit. Make life easier on yourself by having portable firestarters. In case my last suggestion goes horribly wrong. This can be a cheap fix for electrical problems so worth having on hand. Keep small bills and change around for tolls, small purchases, payphones (do those exist anymore? ), vending machines, and the like. Be sure to replace your stockpile regularly. You can write messages to other drivers (keep it civil! ), take notes at an accident site, and give the notebook to small children to scribble on if they're distracting you from driving. If you belong to a roadside assistance program, keep its card handy with your insurance and registration. You might also write down a few contact numbers of people who could help you or who should be notified in a desperate situation. The car safety kits you can buy don't have much of the above, but they do tend to include tools, flares, and either a safety vest or reflective triangle. If you can, throw in a couple screwdrivers, pliers, and a wrench, assuming you or someone who stops to help you knows what to do with them. You'd do well to buy, make, or bring something nice and bright or reflective to increase visibility if you're broken down somewhere. Now, trust me — I have a small car, and I know this reads like a looong list. But you'll find that most of it is quite portable, and the bulkier seasonal items might not be everyday needs for you. Prioritize what seems most necessary and doable, and at least get a start on building your car's emergency stash. Then you'll be able to drive with more confidence, knowing you're better prepared for a breakdown, meltdown, or an even bigger disaster. Be Prepared for Emergencies — Becky at Crafty Garden Mama is reviewing Angela England's new ebook, The Untrained Housewife's Guide to Getting Prepared. See what measures she is learning to adopt in her family. Prepare to Expect a Safe and Beautiful Natural Birth — What do you need to have prepared so that you can have a nice and relaxing birth at home? Lisa at The Squishable Baby shares her list in a guest post at Natural Parents Network. Fire Boxes for Emergency Preparedness — Jana of Jananas tells why she bought a fire box to store important documents and what is stored in the box. Firefighter Training Homeschool Curriculum — Kellie at Our Mindful Life helped her homeschooled kids prepare for emergencies through a Firefighter Training unit. 3 Secrets to a Royal Emergency — Jaye Anne at Wide Awake, Half Asleep tells the secret to living like kings during a storm-induced power outage. Is Your Family Prepared for an Emergency? — Chrystal at Happy Mothering shares an overview of what her family has done to become more prepared for emergencies. What to Do in an Earthquake — Julia at A Little Bit of All of It gives instructions for staying safe in the event of an earthquake as well as tips for teaching your children to keep safe and where to find information online after an earthquake. Spring Cleaning & Preparing, Part 2 — Justine at The Lone Home Ranger organizes and replenishes her emergency supply every spring and is learning to add to the food stockpile by preserving year-round. 15 Must-Haves For The Natural Minded Family When Disaster or Emergency Strikes — Jennifer at Hybrid Rasta Mama shares how she prepares for disaster or an emergency as a natural minded mama. Learn what 15 natural items you should consider having on hand! 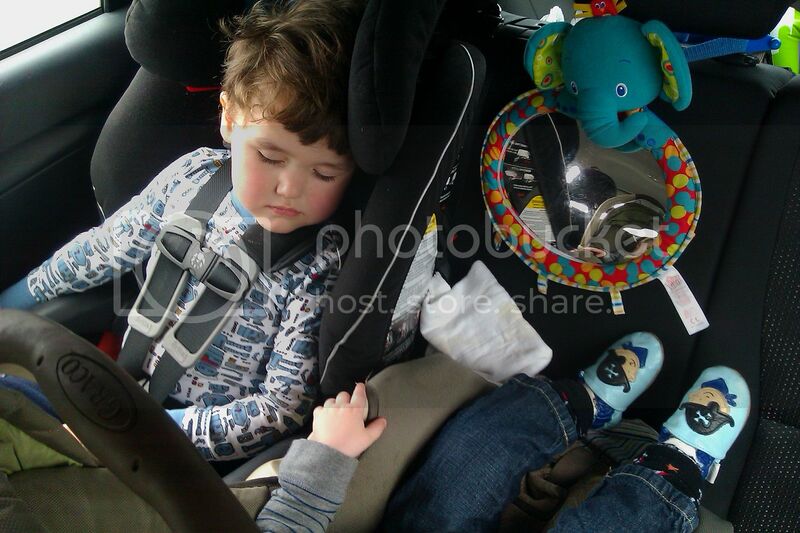 Emergency Preparedness: Cosleeping, Cheezits, Chocolate — Kristine at All the Things in the World was happy to have cosleeping in her emergency tool kit during Hurricane Sandy. Being Prepared For Personal Disasters — Luschka at Diary of a First Child draws on her own recent experiences and considers five things every parent should have in place to ease the burden when sudden disaster strikes. The Natural Emergency Kit That I Always Carry in My Diaper Bag — Charise at I Thought I Knew Mama shares the four green and natural items in her emergency kit that she can't do without when she's out and about with her little ones. Prepared... or not? — Is it dangerous to not prepare? Jorje of Momma Jorje shares whether her family prepares…or not. Pack a car safety kit: 25 must-have items for emergencies — Whether you're out for a leisurely drive or fleeing a disaster, Lauren at Hobo Mama offers tips on stocking your car with emergency supplies that will tide you over if you're stranded. Teaching My Children About Tornados — Destany at They Are All of Me writes about preparing her children for tornado season. Preparing our children for emergencies — Preparing for emergencies means preparing your children, and Robbie at Going Green Mama shares ways on how to empower kids when it comes to emergencies. Emergency Preparedness in Sub-Saharan Africa — After living in Sub-Saharan Africa for 7 years, emergency preparedness is not just a concept any more to Laura from Authentic Parenting. Five Ideas to Keep Babies and Toddlers Safe from Choking — Do you have a baby or toddler who likes to put everything (and I mean *everything*) in her mouth? Dionna at Code Name: Mama does, and today she's sharing a story and some tips on how to keep your little ones safe from choking. I like to carry Army Surplus emergency blankets, though I don't think I have any in our current vehicle. They are TINY and thin, but they are like magic as far as keeping warm in an emergency, or so my husband tells me. I've heard bad things about refilling water bottles with tap and then letting them sit. And then I think letting water sit in a plastic bottle that heats in the Summer... wouldn't that leach out a lot of the plastic yuckiness into the water? Bleh. I don't disagree... but you might want to rotate for fresh often. Oooh, I used to carry dog treats - for emergency tarantula hunting - to distract dogs AWAY from a tarantula hole! Google (or Amazon) search for "Swiss Army Credit Card." I carry it in my wallet and use it ALL THE TIME! I used some Emergency Trash Bags to collect some slightly busted bags of leaves I found on the side of the highway - which I needed for my compost bins! I definitely like to keep a couple of flats (cloth diapers) in the van. They most often gets used to wipe a baby bum after a road-side Pottytunity and also for nose-blowing. Occasionally, though, we'll have a big mess and be SO thankful we have them! Ooh! I like the cash suggestion. We've just recently started carrying a couple of bills - often used to purchase crickets since it feels ridiculous to use the bank card to spend less than $1. It can also come in handy when at a hospital and the vending machine card reader won't work. Thanks for these suggestions. I have a few of them already but some things I never even thought of. I will get working on adding them. Thanks so much! Awesome list! We have little side storage pockets in our trunk that would fit a small emergency case. I think I'm going to add this to Kellie's list at Our Mindful Life and motivate myself to get prepared by doing it with Kieran. Also googling the Swiss army credit card - thanks, Jorje! @Momma Jorje: You know I love how your replies are as long as the post!! Good tip about the Army Surplus blankets. Another idea I read would be those space-age silver blankets, just for a pinch — wouldn't be as good for picnicking. ;) They would work well as a signal flag, too, though! I was thinking stainless steel water bottles, since that's what we have. I agree with the plastic leaching, BUT if it's plasticky water vs. dying of thirst, I'd take plasticky water! The "big boys" just ordered new Swiss Army knives that are keychain sized, but I love the idea of the credit card — will check that out. I love that you got compost by the side of the road! Thanks as always for chiming in! Wow, this is really great! There is so much here that is accounted for. I have been stuck on the side of the road a fair few times with littles in the back. Flat tires on a freeway (without a spare), engine malfunction; caught in torrential downpour and it is absolutely miserable when you're not prepared. Thirst and hunger are the first things that usually get us. I think I'll copy Dionna on this and get motivated to put together a proper emergency kit... and gonna go read Kellie's post! Great reminder to stock back up! We still have a down blanket and such in our trunk, but today was over 100 degrees (in our defense, it snowed like 2 weeks ago, so we aren't as far behind as that temp makes it sound). And if something had happened, breast feeding would sure be tough in 100+ degree weather for very long with no water! Did you mention a towel? Seems like that's one of those things I always wish I had but don't. I had to laugh at the duct tape. A few times I have needed that. Haha! Great list Mama! Many of these items I never even thought of. Duct tape being one. Pet food being another.